Have you seen any dinosaurs today? Bet you have—right outside your window! You might even have a dinosaur feeder in your backyard. At Thanksgiving, perhaps you ate roast dinosaur. Maybe a friend even has pet dinosaur in a cage. You see, dinosaurs aren’t extinct. They’re flying around as birds. Most paleontologists agree that birds really ARE dinosaurs. (Paleontologists are scientists who study extinct creatures.) The dinosaurs from the group called Dromaeosaurids are especially similar to today’s birds. Dromaeosaurids were some of the fiercest and fastest dinosaurs around. They included the Velociraptor you may have seen in the movie Jurassic Park. Some Dromaeosaurids had big brains and sharp teeth. They had a knife-like claw on the second toe. They ran along the ground with their long arms stretched out. They used their flexible wrists to grab their prey. What could such a creature share in common with a peaceful, worm-eating robin? Their long arms are the key. The way Dromaeosaurids put their long arms and wrists to work catching their prey is like the motion birds use today to fly! Unlike the birds you know, Archaeopteryx had teeth. Its wings had claws. Its feet looked like Tyrannosaurus rex’s, only smaller. After all, Archaeopteryx was only about two feet long. Scientists aren’t sure how well Archaeopteryx could fly. 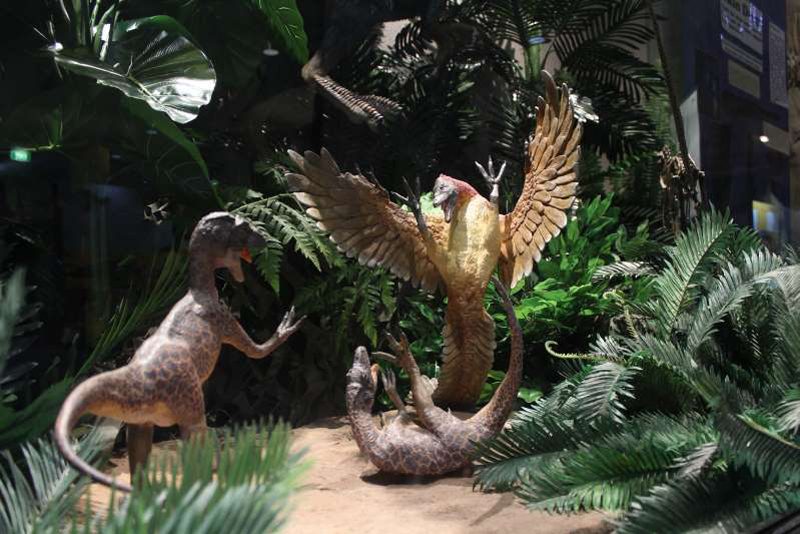 In fact, dinosaurs may have grown feathers and long arms before they really could fly. Feathers may have come about for some reason other than flying. For instance, perhaps feathers helped dinosaurs keep warm. Now we are learning more about how flying developed. The bones of a newly discovered dinosaur, Unenlagia, were found in Patagonia. Unenlagia could not fly. Even so, it is the Dromaeosaurid whose skeleton is most like a modern bird’s skeleton. Unenlagia’s arms could be raised quite high. Perhaps this helped it balance itself while running. This may have also made it easier to flap its arms like wings. Many scientists think that a small running dinosaur like Unenlagia eventually became a flying dinosaur! Flight gave some dinosaurs a better chance at survival. Why? Flying is useful when escaping from an enemy. Just take to the air! And it’s easier to spot food from a “bird’s eye view.” Perhaps because of flight, the only dinosaurs alive today are the feathery flying kind we call birds.